In 1978 Professor Andreas Kappos experienced an earthquake in his hometown of Thessaloniki in Greece that helped shape his career. "Seeing major buildings collapse and my friends, family and the local community coming to terms with the casualties and the devastation made a huge impact on me as a young man," reveals Andreas. It was for this reason that Andreas decided to pursue a career in earthquake study. 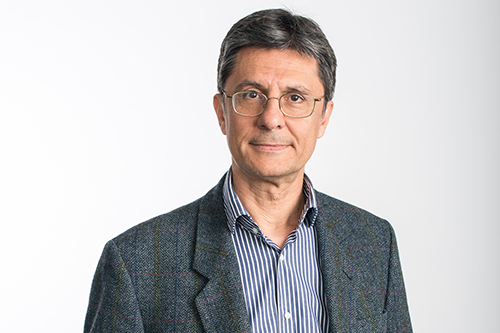 Following a Diploma in Civil Engineering from the Aristotle University of Thessaloniki he went on to do an MSc in Structural Engineering at the University of Southampton and a PhD focussed on evaluating the seismic response of reinforced concrete buildings. Andreas has spent his professional and academic career studying earthquakes across the world - he was a Lecturer and Reader of Earthquake Structural Engineering at Imperial College London and in 1999 returned home to become Professor of Civil Engineering at Aristotle University of Thessaloniki, before joining City in March 2013 as Professor of Civil Engineering. A Fellow at the ICE (Institution of Civil Engineers), Andreas was also made a Fellow of the Institution of Civil Engineers in September 2013. The heart of Andreas's research is humanitarian. "If we can build structures which are more earthquake resistant in high seismic risk areas it will save lives and if we can find materials and techniques to reinforce buildings which have already suffered from earthquakes then we can protect people from getting hurt in the future. To me my research is not just academic it is meaningful for society at large," he explains. In the last few years Andreas has carried out consultancy work on the seismic design of bridges and buildings and extensive research into both fibre and steel-reinforced polymers. These are materials which are not widely used in civil engineering but are particularly resistant to dynamic loading. In the 1978 earthquake Andreas remembers being shocked at how unprepared the government was in anticipating and then reacting to the situation. This is something he hopes to tackle through his policy work, and one of his priorities is to work with committees to improve the earthquake design guidelines for building new structures. Andreas also hopes to work with insurance companies in the UK to try and rationalise their high premium approach to earthquake damage. Andreas sees a lot of opportunities for collaboration within City. "When I moved to the University I realised how many colleagues there are in other Departments who I share common ground with." He has already submitted a European research bid for a project on bridges where he will work closely with colleagues specialising in control theory in the Department of Electrical Engineering. Now he is back in the UK Andreas is also keen to link up with other structural dynamic groups and join forces. Andreas is particularly excited about City's new MSc in Earthquake Engineering which is launching in 2014. He has played a central role in developing the content of the course and has worked with colleagues to restructure the existing modules and introduce some new ones, and is very keen to see how the first set of students gets on. "One of my key aims is for students is to focus on implementing the results of their research and start tackling structural dynamic problems head on so that not only they have the opportunity to pursue a rewarding career, but they also see the direct impact their specialised work has on improving the safety of people with regard to natural hazards," he says. Find out moreabout research undertaken by the Structural and Geotechnical Engineering Centre.